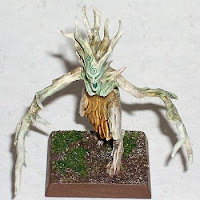 Here's a fairly bad photograph of a dryad, one of ten I painted in the last couple of days. They are so easy to paint up quickly and to a decent standard. I am hoping to construct and paint another ten in the coming week. I also have some wardancers that I think would be fairly easy to complete. If I can get twenty dryads and a dozen wardancers painted in the next few weeks, it will be a solid start to the Wood Elf only section of the elf army. 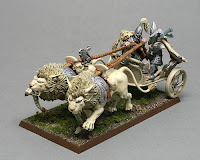 This month's addition to the Elf army is a white lion chariot. I painted it fairly quickly, using a base coat and a glaze or wash for much of the work. It speeds up the army painting process and gives a decent finish in a relatively short time. I also made a start on a bolt thrower and crew at the same time, got about half way through then got distracted by the new skaven figures. I will probably switch to some wood elf models for the next batch, a regiment of dryads should be easy enough to fit in.